Here's the Russian infantry now, along with some officers and artillery! As mentioned before, Peter the Great turned this massive war machine into a Westernized army within less than 10 years. Russian regiments at that time didn't have a completely common uniform. 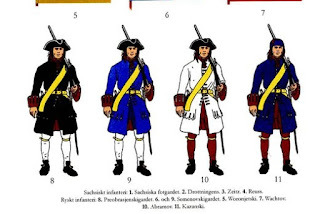 Within a regiment uniforms were the same, but colours differed between regiments. Among other reasons it was just not possible to produce like 50,000 identical uniforms just like that. While it was possible to send out sewing templates and goals for the material quality to meet, dying all of them the same was was the biggest problem at a time at which dyes were made from natural resources. There was a tendency to wear dark green overcoats with red turnbacks, cuffs and collars and Peter the Great's long term plan was to establish that as his empire's army's uniform. Mostly because at the time no other major power had already taken Green for their national uniform. Sources for Russian uniforms of the early 18th century are sketchy (much more so than on the Swedish side), so we have to mainly rely on eye witness accounts of their enemies or international observers. Russian archives in which such sources were stored of course had often fallen victim to Germans, French, rebels, civil wars, communists, looters and other people (often the same people taking on several of the roles listed here). 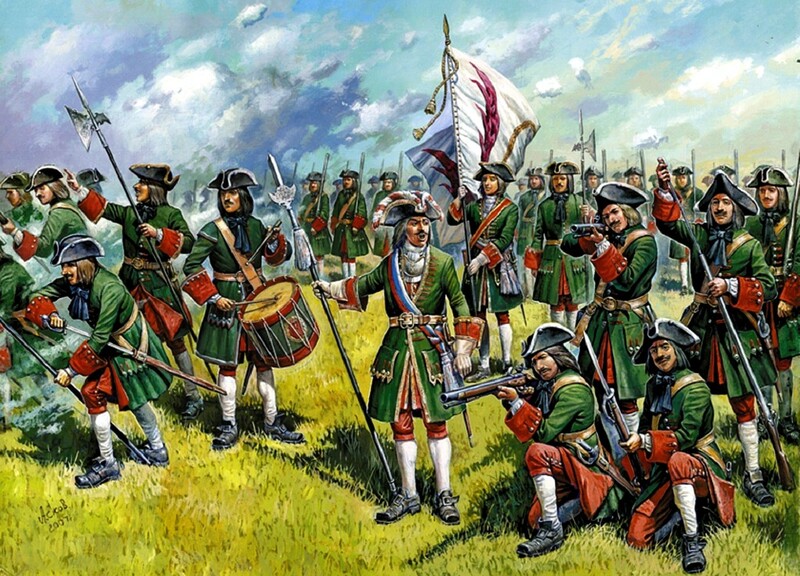 What we do know is the preference of the dark green with red details and some of the other colours used on other regiments. Details on flags are problematic as well.